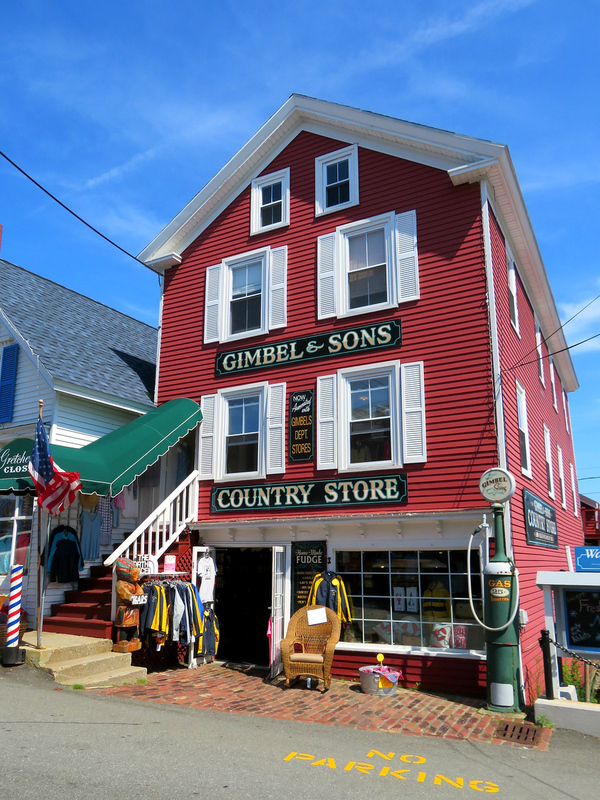 While in Boothbay Harbor, Maine last week, I was drawn to a lovely olde tyme gas pump standing outside Gimbel & Son’s Country Store. I’m not much of a shopper. If I venture in at all, I usually breeze in and out of store fairly quickly. With vacation-centric places it usually same useless crap, different store. But, to my surprise, the inside of this store featured something far more interesting than the usual touristy junk. Just think of all the love letters, postcards and well wishes that passed through those boxes. Memories and life’s little (and big!) moments have seeped into the wood grain. 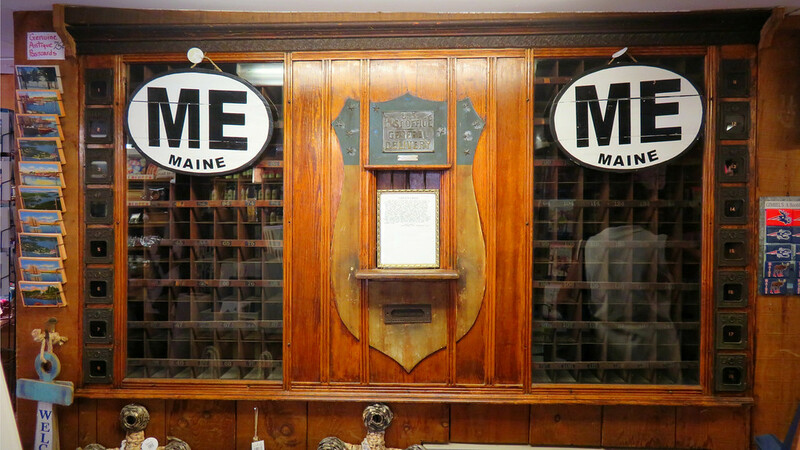 This section of the Naples, Maine post office with its call boxes as well as a few lock boxes served its patrons for many years. Coming in as a brand new piece of equipment shortly after the Civil War, it was a talk-about with its carved oak leaf trimming. Few offices sported such a fine front. It served in two old country stores, was set up in the building that is now Naples public library, then moved up to a new home where it phased out about 1960. Once in the change of Postmasters, it was moved out in the night from its Republican environment. 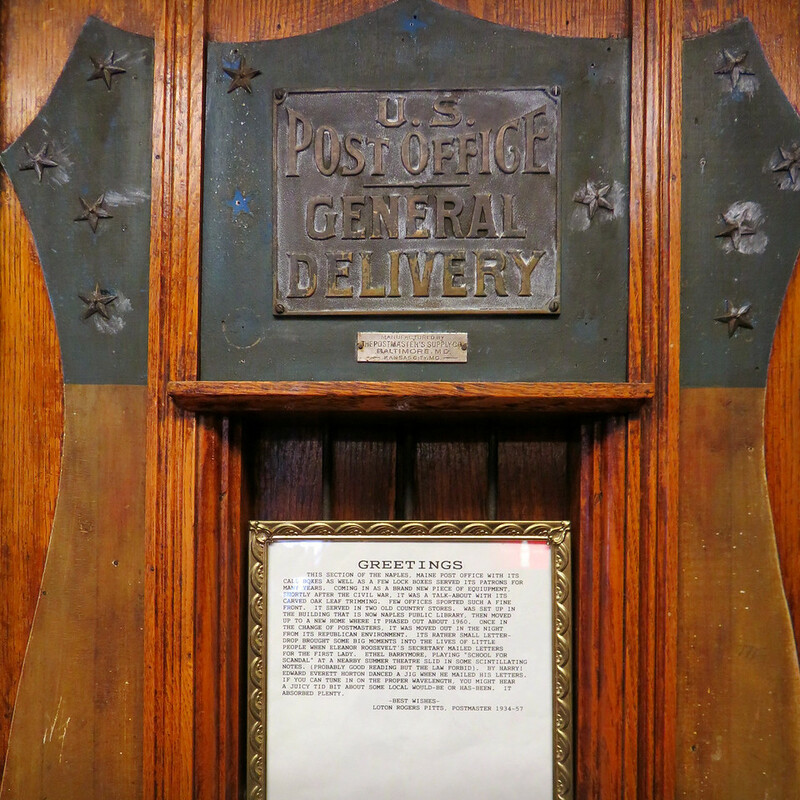 It’s rather small letter drop brought some big moments into the lives of little people when Eleanor Roosevelt’s secretary mailed letters for the First Lady. Ethel Barrymore, playing “school for Scandal” at a nearby summer theater slid in some scintillating nodes, (probably good reading but the law forbid). By Harry!Edward Everett Horton danced a jig when he mailed his letters. If you can tune in on the proper wavelength, you might hear a juicy tidbit about some local would-be or has-been. It absorbed plenty.